"Even as a student he was very religious. Every Saturday and Sunday he would go to Tiruparankunram and go round the Subramania Swami Temple with fervent religious ecstasy. He used to take me several times with him and make me go around the temple saying, 'God's creation is alike and there is no difference in creation. God is the same, the apparent differences is Gods are created by man'. In the company of Venkataraman I never felt any difference between a mosque and the Subramania Swami temple. This instruction of his really implanted in me a better understanding of the secret approach to religion and thenceforth I never felt any difference between Hindu God and any other God." orthodox families, Mother Azhagamma used to feed him in the Tiruchuzhi house, with her own hands. Did you have a nice swim? "Once when I was a young boy, a friend and I were in the Arunachala Temple. blank - I became unconscious. ashram and sat in the hall without telling anyone what had just happened. occasion when he was stung by snake and he became black and blue in his body and Sri Ramana told him: Nothing has happened. You wake up. He woke up! Jnanis also can display Siddhis but they do not do it so often. Venkataraman's only sister AlamElu was a little girl. Being the only female child, she was pampered by the family. It is said that she used to cry to see her grandfather living in Pasalai, a village a few kilometers from Tiruchizhi. Once she was taken there she at once would want to go back to her mother. Sometimes Venkataraman would accompany her. While returning seeing his sister's tender feet getting blisters walking on the rough path, Venkataraman would cut off the wild vines growing on the way side and tie round her little feet which will serve as slippers. Such was his concern for his sister. Self Realization, spread to the whole universe. And Grace flowed in huge quantity for all the ardent devotees. A devotee asked, â€œCan anyone get any benefit by repeating sacred syllables (mantras) picked up casually?â€� Sri Bhagavan replied, â€œNo. He must be competent and initiated in such mantras.â€� To illustrate this he told the following story. There seems to be a natural affinity between monkeys and humans. Recall how the monkeys assisted Sri Rama in the Ramayana.Bhagavan was able to converse with monkeys and after a close observation of their ways discovered that they had a social and political structure or hierarchy. On several occasions the monkeys would go to the Maharshi with their disputes for arbitration. He would patiently listen to them and effect reconciliation among the contending parties. A monkey-chief once bit an infant monkey which fainted. Taking it to be dead the monkey group left it there and went away. A little later the infant regained consciousness and made its way to Bhagavan's ashram. As it was limping, the ashramites referred to it as Nondi (the Lame one). Nondi was nursed back to normalcy. On one occasion the group of monkeys to which Nondi belonged passed by the ashram and took him back into their group. him and found his way back to the Maharshi's lap. the ashram with his retinue but not finding him there spoilt all the trees of the ashram. guessed that Nondi had become a Chief. After that Nondi came down and sat on the Maharshi's lap. Thereafter Nondi's predecessor in office came up and paid homage to Nondi. This confirmed Bhagavan's guess. At mealtime Nondi sat beside Bhagavan but refused to touch the food and walked away. Surprised at this, the Maharshi followed him. Nondi went and sat among his subjects, with his queens sitting closeby. (Among monkeys the queens of the previous king continued to retain their status even under the new regime). It became clear that Nondi would not partake of any meal without his subjects also being served. So, the ashramites, arranged a `royal banquet' for Nondi.A little later due to the machinations of his minister,Nondi lost his position and began living apart from his group with his progeny. "Two months after the Maharshi left Skandasramam and settled down at Ramanasramam, Nondi came searching for him and continued to visit him every fortnight. dead monkey with all honours due to a sannyasin. On a festival day in 1944, some ladies were decorating the floor of the Asramam with rice paste prepared by soaking rice in water and grinding it subsequently. While returning from the cowhed, Bhagavan remarked to the people following him,â€� Look at those people, See what they are doing. They concentrate their mind on that sort of work. What to do? Let them carry on. Be careful not to step on the drawings. Why should we step on them when they are doing it with such great devotion,â€� So saying, he walked carefully without disturbing the designs and sat in the hall. An Andhra gentleman enquired, â€œIs it for feeding the ants that in the dhanurmasa, i.e. month of December-January , that floors are decorated with rice powder?. placed the pillows. When Sri Bhagavan came back from stroll, He found the smell of DDT and understood the trick. He said: Why have you killed them all? Let them have some food in my blood! He mildly rebuked the attendant. he opened the gate of my heart and I was also established in his state. made us, by his look, like himself. Sometime back, she was sending food for about a week or ten days through someone else because perhaps she was out of town or not quite well. The cooks one day forgot to serve the food sent by her and completed serving all other items of food cooked in the Ashram. Bhagavan who would usually beckon to others to start eating and would himself commence doing so, sat silently that day with his left hand under the chin, and his right hand on the leaf. The people there sitting in front began to look at one another and those in the kitchen, or wondering and enquiring in whispers about the possible reason. Suddenly they remembered that the food sent by Echamma had not been served and, when they served it saying, â€œOh, we have forgotten,â€� he gave the formal signal to the others to eat and he too commenced eating the food. It is usual for him to eat with greater relish the raw groundnuts offered to him by a devotee than the highly seasoned sweets and puddings offered by rich people, just as Lord Krishna ate with relish the beaten rice handed over to him by Kuchela. Bhagavan and one Mudaliar Swami were taking stroll behind the Skandasramam site. There was a huge rock about 15 feet high with a cleft. A shepherdess was standing nearby there crying. Bhagavan asked the reason for her sorrow. She said, "A sheep of mine has slipped the reason for her sorrow. She said. Bhagavan descended into the cleft, took the sheep on his shoulders, climbed up to the surface and delivered the sheep to her. This was a remarkable feat for any human being. Ramana in his kindness did that for the shepherdess. I recollect Brahmana Swami gave me once or twice some books to read - which book it was I do not remember. I do not recollect whether Palaniswami alone lived with Brahmana Swami, visitors like overseer Sheshair used to go to Brahmana Swami often or daily and give him eatables like fruits, I do not remember their questioning Brahmana Swami. I stayed there 3 months being more attracted by the personality of Brahmana Swami rather than by the place. He was so unworldy - full of deep meditation. I thought he was the only person in whom I felt I had a sort of confidence. Since then I went to no other for guidance. He has always been my guiding light. I visited Maharshi some years later in 1908, 1913 (i.e., soon after my marriage in 1912), 1917) (after I returned from Japan), 1923, 1927 etc. In 1927 I asked Maharshi how long I was to be tossed about in worldly affairs. He said "The play should end (ஆட்டம் கலைய வெண்டும்) and when it is over (ஆடிமுடிந்த பிரகு) you can come here. The play is not yet over - evidently. As I happened to visit Madras on account of social or domestic necessities I have called here to see Maharshi. I tried and began my dhyana in 1900 but got no aid then. Only after my marriage in 1912 I gained a bit of proficiency in dhyana. I now spend about an hour in dhyana. 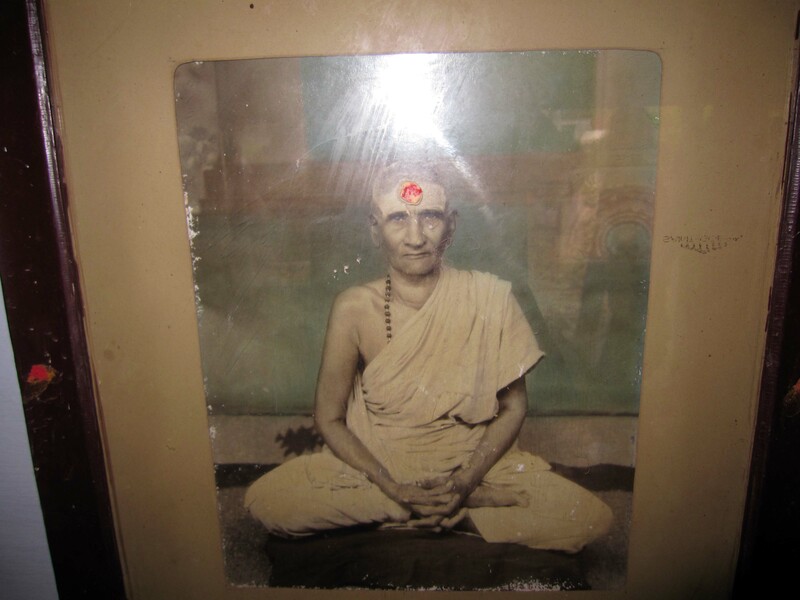 Swarupa Dhyana of this same Sat Guru in my mind and I see lights while I concentrate and I reported this to Maharshi. He said "The vastu is inside and it is seen there." I have received no other instruction so far as I can remember. as Markandeya caught the lingam and told him about the last words of my father. With tender love beaming out of his eyes, he said that my father had taken leave of him before passing away! When I beseeched him to bless me, he said, â€œIt will be all right in the endâ€�. Those words of benediction have rung in my ears and brought me hope in moments which I cherish in my heart as the most worthwhile event in my life.